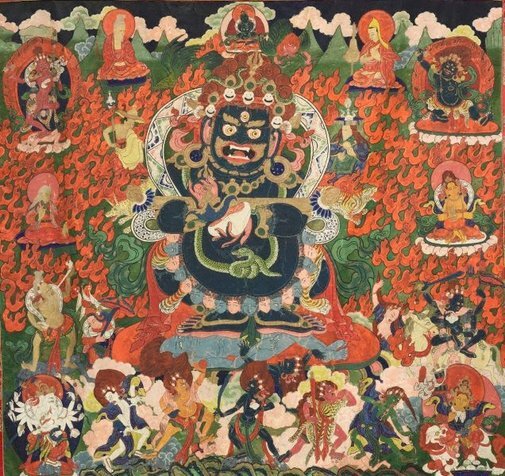 This is a painting of Black Mahakala, one of the eight dharmapalas (protectors of Buddhism). The name of this image is Panjara Mahakala, which refers to his position as the deity of cemeteries who destroys the cages of ignorance in which living beings are trapped. Mahakala is particularly popular in Vajrayana Buddhism because he upholds justice and punishes evil-doers, as well as removes the barriers to enlightenment. His wrathful expression, the objects he holds and wears, and the terrifying scenes around him indicate what is necessary to defeat the forces of evil and ignorance. 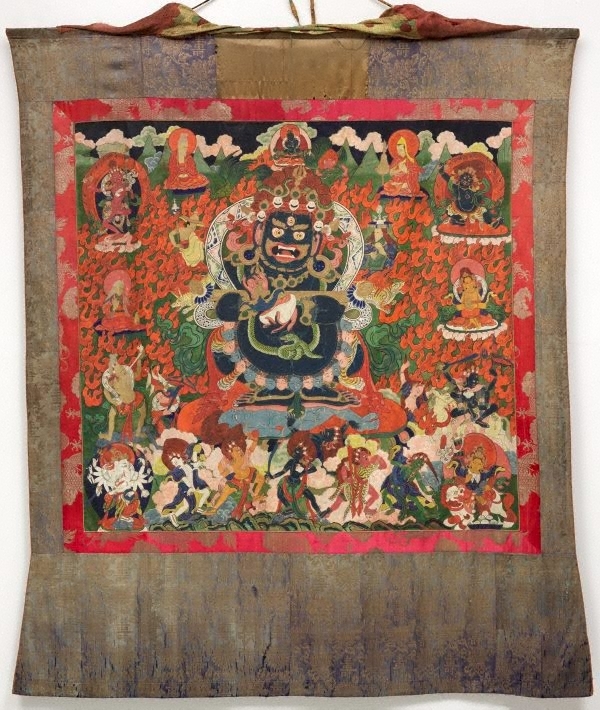 Directly above Mahakala is the blue-skinned Adi Buddha. He sits cross-legged and holds a vajra (thunderbolt) and ghanta (bell) with arms crossed over his chest in a position called vajra humkara mudra. This position represents the combination of wisdom and compassion that is necessary for enlightenment in Vajrayana Buddhism.